Hutchinson-Gilford progeria syndrome (HGPS) is an extremely rare hereditary disease that affects the skin, musculoskeletal system, and vasculature. HGPS is characterized by signs of premature aging most notable in the skin, cardiovascular system, and musculoskeletal systems. HGPS is caused by mutations in LMNA that result in the production of an abnormal form of lamin A termed progerin. The term progeria is derived from the Greek word geras, meaning old age. Significant morbidity and mortality result from accelerated atherosclerosis of the carotid and coronary arteries, leading to premature death during the first or second decade of life. HGPS is considered a segmental aging syndrome, as affected patients do not manifest all of the typical features of aging, such as increased incidence of cancer and neurocognitive decline. See the image shown below depicting Hutchinson-Gilford progeria syndrome in an infant. Early Hutchinson-Gilford progeria syndrome. 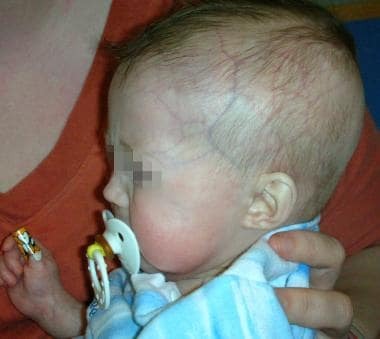 Note the alopecia, prominent scalp veins, and frontal bossing apparent in this 12-month-old infant with Hutchinson-Gilford progeria syndrome. Midface hypoplasia and micrognathia are less apparent. In 1886, Hutchinson  described the first patient with HGPS, a 6-year-old boy whose overall appearance was that of an old man. In 1887, Gilford  described a second patient with similar clinical findings; in 1904, [4, 5] he published a series of photographs depicting the clinical manifestations of progeria at different ages. To date, approximately 100 patients with HGPS have been described in the literature. Patients with Hutchinson-Gilford progeria syndrome (HGPS) develop clinical features of accelerated aging, including accelerated atherosclerosis of the cerebral and coronary arteries. Unlike arteriosclerosis in the general population, however, in progeria, the only lipid abnormality is decreased high-density lipoprotein cholesterol levels. Interestingly, patients with HGPS do not develop other disease processes associated with aging, such as increased tumor formation, cataract development, or senility. In this sense, HGPS is considered a segmental progeroid syndrome in that it does not recapitulate all of the characteristic phenomena of aging. Patients with HGPS also develop loss of subcutaneous fat and muscle, skin atrophy, osteoporosis, arthritis, poor growth, and alopecia. There is evidence that patients with HGPS also manifest features of skeletal dysplasia with abnormalities in bone structural geometry and skeletal strength. Extensive lipofuscin deposition, a marker for aging, is extensively distributed in patients with HGPS. Affected organs include the kidneys, brain, adrenal glands, liver, testes, and heart. These clinical manifestations occur as the result of defects in processing and function of lamin A, an intermediate filament protein component of the nuclear membrane that regulates a diverse number of cellular functions, including nuclear morphology and integrity, DNA repair, regulation of gene expression, and telomere stability; the end result of these defects is genomic instability, decreased cell proliferation, and premature cell senescence and death. The abnormal protein, progerin, represents a truncated form of the lamin A precursor prelamin A and results from mutations in LMNA. It is interesting to note that mutations in LMNA are associated not only with premature aging syndromes (HPGS, restrictive dermopathy, and atypical Werner syndrome), but also with several muscular dystrophies, lipodystrophic syndromes, and mandibuloacral dysplasia. Clinically, children with progeria develop atherosclerosis, arteriosclerosis of small vessels, and prominent adventitial fibrosis with increasing deposition of progerin within coronary arteries. The accelerated vascular stiffening and peripheral vascular occlusive disease that develop resemble the cardiovascular features of normal aging and atheroscleroisis. Together with the clinical observations of accelerated and often fatal arteriosclerosis, these findings suggest that the effects of progerin on the cardiovascular system are a major contributor to the pathophysiology of HGPS. Interestingly, spontaneous accumulation of progerin has been observed in cultured fibroblasts from normally aged individuals in combination with similar nuclear defects, further reinforcing the theory that HGPS results, at least in part, from accelerated production and accumulation of progerin. It is important to note that the pathophysiology of HGPS results from the presence of progerin and a dominant-negative effect on lamin A function and not simply from the absence of normal lamin A.
HGPS is a rare disease with a reported prevalence of 1 in 8 million births. The true prevalence, however, has been suggested to be closer to 1 in 4 million births because many cases likely go undiagnosed or are misdiagnosed. The incidence in the Netherlands over the last century was 1:4,000,000. Approximately 100 cases of HGPS have been reported in the literature. White persons represent 97% of reported patients. The reason for this racial disparity is unknown. HGPS has a slight male predilection; the male-to-female ratio is 1.5:1. Clinical manifestations of HGPS may not be recognized or apparent at birth, although many affected children present with sclerodermatous skin changes. Delayed recognition of the characteristic facial features along with the cutaneous and musculoskeletal manifestations may not occur until age 6-12 months or older, when the development of failure to thrive engenders a more thorough evaluation. The average life expectancy for a patient with HGPS is 13 years, with an age range of 7-27 years. Morbidity and mortality in persons with HGPS occur primarily as a result of atherosclerosis of the coronary and cerebrovascular arteries, with at least 90% of patient deaths directly related to complications of progressive atherosclerosis. Cardiovascular complications include myocardial infarction and congestive heart failure. Interstitial fibrosis, diffuse myocardial fibrosis, and calcification of the mitral and aortic valves may occur. Cerebrovascular complications occurring as a result of cerebrovascular infarction include hemiplegia, subdural hematoma, and seizures. Other causes of morbidity and mortality include marasmus, loss of mobility, and inanition. Hutchinson J. A case of congenital absence of hair with atrophic condition of the skin and its appendages. Lancet. 1886. 1:923. Hutchinson J. Case of congenital absence of hair, with atrophic condition of the skin and its appendages, in a boy whose mother had been almost wholly bald from alopecia areata from the age of six. Transactions of the Medico-Chirurgical Society of Edinburgh. 1886. 69:473-7. Gilford H. On a condition of mixed premature and immature development. Medico-Chirurgical Transactions. 80:17-45. Gilford H. Progeria: a form of senilism. Practitioner. 1904. 73:188-217. Gilford H. Ateliosis and progeria: contniuous youth and premature old age. Br Med J. 1904. 2:914-8. Gordon CM, Gordon LB, Snyder BD, Nazarian A, Quinn N, Huh S, et al. Hutchinson-gilford progeria is a skeletal dysplasia. J Bone Miner Res. 2011 Jul. 26(7):1670-9. [Medline]. Ding SL, Shen CY. Model of human aging: recent findings on Werner's and Hutchinson-Gilford progeria syndromes. Clin Interv Aging. 2008. 3(3):431-44. [Medline]. Stehbens WE, Wakefield SJ, Gilbert-Barness E, Olson RE, Ackerman J. Histological and ultrastructural features of atherosclerosis in progeria. Cardiovasc Pathol. 1999 Jan-Feb. 8(1):29-39. [Medline]. McClintock D, Gordon LB, Djabali K. Hutchinson-Gilford progeria mutant lamin A primarily targets human vascular cells as detected by an anti-Lamin A G608G antibody. Proc Natl Acad Sci U S A. 2006 Feb 14. 103(7):2154-9. [Medline]. [Full Text]. Olive M, Harten I, Mitchell R, Beers JK, Djabali K, Cao K, et al. Cardiovascular pathology in Hutchinson-Gilford progeria: correlation with the vascular pathology of aging. Arterioscler Thromb Vasc Biol. 2010 Nov. 30(11):2301-9. [Medline]. [Full Text]. Gerhard-Herman M, Smoot LB, Wake N, Kieran MW, Kleinman ME, Miller DT, et al. Mechanisms of premature vascular aging in children with Hutchinson-Gilford progeria syndrome. Hypertension. 2012 Jan. 59(1):92-7. [Medline]. [Full Text]. Scaffidi P, Misteli T. Lamin A-dependent nuclear defects in human aging. Science. 2006 May 19. 312(5776):1059-63. [Medline]. [Full Text]. Gordon LB, Massaro J, D'Agostino RB Sr, Campbell SE, Brazier J, Brown WT, et al. Impact of farnesylation inhibitors on survival in Hutchinson-Gilford progeria syndrome. Circulation. 2014 Jul 1. 130 (1):27-34. [Medline]. Merideth MA, Gordon LB, Clauss S, Sachdev V, Smith AC, Perry MB, et al. Phenotype and course of Hutchinson-Gilford progeria syndrome. N Engl J Med. 2008 Feb 7. 358(6):592-604. [Medline]. Hennekam RC. Hutchinson-Gilford progeria syndrome: review of the phenotype. Am J Med Genet A. 2006 Dec 1. 140(23):2603-24. [Medline]. Gordon LB, McCarten KM, Giobbie-Hurder A, et al. Disease progression in Hutchinson-Gilford progeria syndrome: impact on growth and development. Pediatrics. 2007 Oct. 120(4):824-33. [Medline]. Rork JF, Huang JT, Gordon LB, Kleinman M, Kieran MW, Liang MG. Initial cutaneous manifestations of Hutchinson-Gilford progeria syndrome. Pediatr Dermatol. 2014 Mar-Apr. 31 (2):196-202. [Medline]. Domingo DL, Trujillo MI, Council SE, Merideth MA, Gordon LB, Wu T, et al. Hutchinson-Gilford progeria syndrome: oral and craniofacial phenotypes. Oral Dis. 2009 Apr. 15(3):187-95. [Medline]. [Full Text]. Guardiani E, Zalewski C, Brewer C, Merideth M, Introne W, Smith AC, et al. Otologic and audiologic manifestations of Hutchinson-Gilford progeria syndrome. Laryngoscope. 2011 Oct. 121(10):2250-5. [Medline]. [Full Text]. Pereira S, Bourgeois P, Navarro C, Esteves-Vieira V, Cau P, De Sandre-Giovannoli A. HGPS and related premature aging disorders: from genomic identification to the first therapeutic approaches. Mech Ageing Dev. 2008 Jul-Aug. 129(7-8):449-59. [Medline]. Dechat T, Pfleghaar K, Sengupta K, et al. Nuclear lamins: major factors in the structural organization and function of the nucleus and chromatin. Genes Dev. 2008 Apr 1. 22(7):832-53. [Medline]. Cao H, Hegele RA. LMNA is mutated in Hutchinson-Gilford progeria (MIM 176670) but not in Wiedemann-Rautenstrauch progeroid syndrome (MIM 264090). J Hum Genet. 2003. 48(5):271-4. [Medline]. Dechat T, Shimi T, Adam SA, et al. Alterations in mitosis and cell cycle progression caused by a mutant lamin A known to accelerate human aging. Proc Natl Acad Sci U S A. 2007 Mar 20. 104(12):4955-60. [Medline]. Bar DZ, Arlt MF, Brazier JF, Norris WE, Campbell SE, Chines P, et al. A novel somatic mutation achieves partial rescue in a child with Hutchinson-Gilford progeria syndrome. J Med Genet. 2016 Dec 5. [Medline]. Mounkes LC, Kozlov S, Hernandez L, Sullivan T, Stewart CL. A progeroid syndrome in mice is caused by defects in A-type lamins. Nature. 2003 May 15. 423(6937):298-301. [Medline]. Csoka AB, English SB, Simkevich CP, et al. Genome-scale expression profiling of Hutchinson-Gilford progeria syndrome reveals widespread transcriptional misregulation leading to mesodermal/mesenchymal defects and accelerated atherosclerosis. Aging Cell. 2004 Aug. 3(4):235-43. [Medline]. Park WY, Hwang CI, Kang MJ, et al. Gene profile of replicative senescence is different from progeria or elderly donor. Biochem Biophys Res Commun. 2001 Apr 13. 282(4):934-9. [Medline]. Ly DH, Lockhart DJ, Lerner RA, Schultz PG. Mitotic misregulation and human aging. Science. 2000 Mar 31. 287(5462):2486-92. [Medline]. Liu Y, Rusinol A, Sinensky M, Wang Y, Zou Y. DNA damage responses in progeroid syndromes arise from defective maturation of prelamin A. J Cell Sci. 2006 Nov 15. 119(Pt 22):4644-9. [Medline]. Almeida P, Hernandez J, Marti M, Hernandez B. What syndrome is this? Wiedemann-Rautenstrauch syndrome. Pediatr Dermatol. 2005 Jan-Feb. 22(1):75-8. [Medline]. Cleveland RH, Gordon LB, Kleinman ME, Miller DT, Gordon CM, Snyder BD, et al. A prospective study of radiographic manifestations in Hutchinson-Gilford progeria syndrome. Pediatr Radiol. 2012 Sep. 42(9):1089-98. [Medline]. Ullrich NJ, Silvera VM, Campbell SE, Gordon LB. Craniofacial abnormalities in Hutchinson-Gilford progeria syndrome. AJNR Am J Neuroradiol. 2012 Sep. 33(8):1512-8. [Medline]. Silvera VM, Gordon LB, Orbach DB, Campbell SE, Machan JT, Ullrich NJ. Imaging characteristics of cerebrovascular arteriopathy and stroke in Hutchinson-Gilford progeria syndrome. AJNR Am J Neuroradiol. 2013 May. 34(5):1091-7. [Medline]. Cao K, Graziotto JJ, Blair CD, Mazzulli JR, Erdos MR, Krainc D, et al. Rapamycin reverses cellular phenotypes and enhances mutant protein clearance in hutchinson-gilford progeria syndrome cells. Sci Transl Med. 2011 Jun 29. 3(89):89ra58. [Medline]. Ramos FJ, Chen SC, Garelick MG, Dai DF, Liao CY, Schreiber KH, et al. Rapamycin reverses elevated mTORC1 signaling in lamin A/C-deficient mice, rescues cardiac and skeletal muscle function, and extends survival. Sci Transl Med. 2012 Jul 25. 4(144):144ra103. [Medline]. [Full Text]. Cenni V, Capanni C, Columbaro M, Ortolani M, D'Apice MR, Novelli G, et al. Autophagic degradation of farnesylated prelamin A as a therapeutic approach to lamin-linked progeria. Eur J Histochem. 2011 Oct 19. 55(4):e36. [Medline]. [Full Text]. Graziotto JJ, Cao K, Collins FS, Krainc D. Rapamycin activates autophagy in Hutchinson-Gilford progeria syndrome: implications for normal aging and age-dependent neurodegenerative disorders. Autophagy. 2012 Jan. 8(1):147-51. [Medline]. [Full Text]. Gabriel D, Gordon LB, Djabali K. Temsirolimus Partially Rescues the Hutchinson-Gilford Progeria Cellular Phenotype. PLoS One. 2016 Dec 29. 11 (12):e0168988. [Medline]. Pellegrini C, Columbaro M, Capanni C, D'Apice MR, Cavallo C, Murdocca M, et al. All-trans retinoic acid and rapamycin normalize Hutchinson Gilford progeria fibroblast phenotype. Oncotarget. 2015 Aug 13. [Medline]. Sadeghi-Nejad A, Demmer L. Growth hormone therapy in progeria. J Pediatr Endocrinol Metab. 2007 May. 20(5):633-7. [Medline]. Gabriel D, Roedl D, Gordon LB, Djabali K. Sulforaphane enhances progerin clearance in Hutchinson-Gilford progeria fibroblasts. Aging Cell. 2015 Feb. 14 (1):78-91. [Medline]. Meta M, Yang SH, Bergo MO, Fong LG, Young SG. Protein farnesyltransferase inhibitors and progeria. Trends Mol Med. 2006 Oct. 12(10):480-7. [Medline]. Capell BC, Olive M, Erdos MR, et al. A farnesyltransferase inhibitor prevents both the onset and late progression of cardiovascular disease in a progeria mouse model. Proc Natl Acad Sci U S A. 2008 Oct 14. 105(41):15902-7. [Medline]. Sagelius H, Rosengardten Y, Schmidt E, Sonnabend C, Rozell B, Eriksson M. Reversible phenotype in a mouse model of Hutchinson-Gilford progeria syndrome. J Med Genet. 2008 Dec. 45(12):794-801. [Medline]. Yang SH, Meta M, Qiao X, et al. A farnesyltransferase inhibitor improves disease phenotypes in mice with a Hutchinson-Gilford progeria syndrome mutation. J Clin Invest. 2006 Aug. 116(8):2115-21. [Medline]. Yang SH, Qiao X, Fong LG, Young SG. Treatment with a farnesyltransferase inhibitor improves survival in mice with a Hutchinson-Gilford progeria syndrome mutation. Biochim Biophys Acta. 2008 Jan-Feb. 1781(1-2):36-9. [Medline]. Wang Y, Ostlund C, Worman HJ. Blocking protein farnesylation improves nuclear shape abnormalities in keratinocytes of mice expressing the prelamin A variant in Hutchinson-Gilford progeria syndrome. Nucleus. 2010 Jul. 1(5):432-439. [Medline]. [Full Text]. Gordon LB, Kleinman ME, Miller DT, Neuberg DS, Giobbie-Hurder A, Gerhard-Herman M, et al. Clinical trial of a farnesyltransferase inhibitor in children with Hutchinson-Gilford progeria syndrome. Proc Natl Acad Sci U S A. 2012 Oct 9. 109(41):16666-71. [Medline]. [Full Text]. Ullrich NJ, Kieran MW, Miller DT, Gordon LB, Cho YJ, Silvera VM, et al. Neurologic features of Hutchinson-Gilford progeria syndrome after lonafarnib treatment. Neurology. 2013 Jul 30. 81 (5):427-30. [Medline]. Gordon LB, Kleinman ME, Massaro J, D'Agostino RB Sr, Shappell H, Gerhard-Herman M, et al. Clinical Trial of the Protein Farnesylation Inhibitors Lonafarnib, Pravastatin, and Zoledronic Acid in Children With Hutchinson-Gilford Progeria Syndrome. Circulation. 2016 Jul 12. 134 (2):114-25. [Medline]. Lee JM, Nobumori C, Tu Y, Choi C, Yang SH, Jung HJ, et al. Modulation of LMNA splicing as a strategy to treat prelamin A diseases. J Clin Invest. 2016 Apr 1. 126 (4):1592-602. [Medline]. Sclerodermatous skin changes in Hutchinson-Gilford progeria syndrome. This 12-month-old infant with Hutchinson-Gilford progeria syndrome has indurated, shiny skin with dyspigmentation. Sclerodermatous skin changes in Hutchinson-Gilford progeria syndrome. This 12-month-old infant has indurated, shiny skin with dyspigmentation. Enlarged joints, mild flexion contractures, and sclerodermatous skin changes are seen in this 12-month-old infant with Hutchinson-Gilford progeria syndrome. Sclerodermatous skin changes in Hutchinson-Gilford progeria syndrome. This 12-month-old infant with Hutchinson-Gilford progeria syndrome has indurated, shiny skin and mild joint contractures involving the extremities and trunk.